You might know that I develop and run Marinemad.com a social networking website for Marine Aquaria with a suite of software management tools for this purpose. About a year ago I met some scientists at the University Of Essex and agreed to collaboratively work with them in creating a questionnaire based on collating knowledge from people who have aquariums at home and are growing and culturing corals. The Coral Aquarist Research Network is the project that facilitated the experiment of collating this information from the general public, and Pippa Mansell (the project leader) set up a wonderful line up for a day of talks the general public could attend at London Zoo (ZSL). 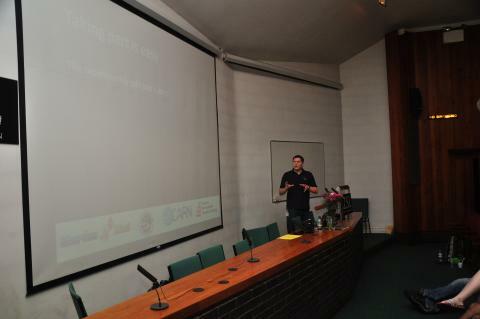 The talks involved a number of renownd scientists from the UK and I was lucky enough to get a slot to talk about the MarineMad project and how it facilitates CARN in the “Big Experiment”. This entry was posted in Aquaria, Talks and Exhibitions and tagged zsl London Zoo Aquaria CARN talks.